Be sure to check out our awesome Tower photo on page two! The reason for visiting DCA today was because our friends Tommy and James were in town from po dunk South Carolina. As you can see from this photo, they are very 'happy'. They let us crash with them at the Grand California. Isn't the view pretty? 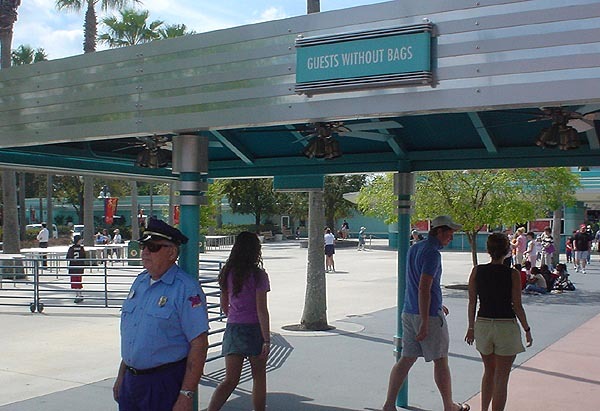 Ahh, nice to see that Disney has finally created a bag-check area before the turnstiles like they have in Florida. But why....WHY on earth do they not have a "Guests Without Bags" line like THIS one at WDW? Are we sure Gregg's a dude??? Or was he the star of the 70s movie "Rabbit Test?" ...VERY BUSY! It was still a 120 minute wait for Screamin' 15 minutes before park closing! And Grizzly had a 3 hour line almost the entire day. Including an AWESOME Tower photo!!! Click HERE to read our Disney's California Adventure's Tower of Terror Review.